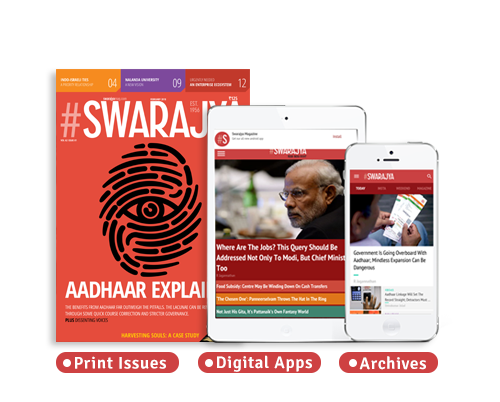 ﻿ Swarajya Subscriptions|Buy A Swarajya Subscription Now! Please Wait While We Process Your Subscription. Help us reach India’s student community by sponsoring subscriptions through ourcampus outreach programme. You get all the benefits, exlusive invites to events and more. Do take a look! You can now get your FREE student subscription from our campus outreach programme. What If I Have Queries/Clarifications? How Do I Reach You? Please drop in a line at subscriptions@swarajyamag.com and you should hear back from us in 24 hours. How Do I Proceed If I'd Like To Transfer The Amount To Your Bank Account Or Send In A Cheque? Triyambava Kalapatti Main Road, Coimbatore. IFSC Code: HDFC0001068 Write to us at subscriptions@swarajyamag.com (with the address where you want the copies to be delivered), once you finish your transfer / sent in the cheque.